Prairie View Animal Hospital, Wahoo Nebraska -- Veterinary Care You And Your Pet Can Count On! 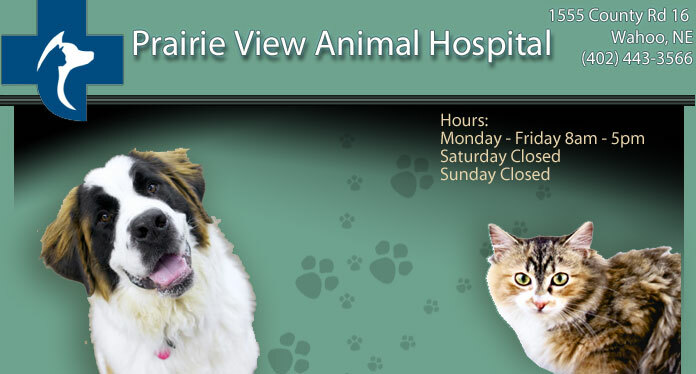 Prairie View Animal Clinic was established over 30 years ago. In 2012, Dr. Rachel Oolman and Aaric Oolman purchased the clinic, and it became Prairie View Animal Hospital. At Prairie View Animal Hospital our doctor and staff are committed to providing an excellent quality of care for our clients and patients. Prairie View Animal Hospital strives to provide a modern veterinary facility without forgetting that our clients and patients are our friends and neighbors. Prairie View Animal Hospital will help provide preventative care that is unique to each of our patient’s health status. We are also available for routine surgeries in addition to emergency and critical care.